They expected door crashers and deep price cuts, but a little more than a week into Target Canada's liquidation sales, some shoppers are complaining about what they didn't expect: meagre discounts. But those in the liquidation business say they often need to start slowly. Their main goal is not to offer great deals to demanding customers. Instead, liquidators aim to rake in as much money as possible before the doors are locked for good. As shoppers scour the aisles at a Target Canada store in Toronto, they scope out discounts that still range between 10 and 30 per cent for most goods. Many food items, furniture and toiletries are still stubbornly stuck at just 10 per cent off. A store clerk says prices for handbags and accessories have dropped on this day from 10 down to 30 per cent off. But that's not enough to please many customers. "Everything is overpriced," complains Juliana Watts, who walked out empty handed. "I think 20 per cent is nothing. Even it they take 20 per cent off, it's still too expensive." David Kebede, who was hoping for a deeper discount on a children's bed, agreed. "Liquidation means everything is 50 per cent off, so what's the use?" "Ten per cent off bedding is nothing," scoffs Dalene Benatar. 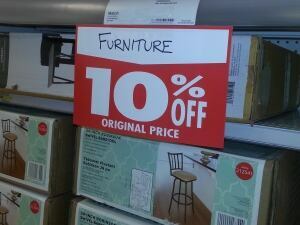 "They didn't realize it is a liquidation sale and they didn't treat it as such. I was expecting more along the lines of between 30 and 40 per cent off throughout the store. "I think they're just a little greedy." That's the point, said Jeff Schwarz, a Vancouver liquidator who hosts a reality TV show on the topic. [prices] are at such a low discount is they're trying to milk it, that's the bottom line," said Schwarz, who is not involved in the Target process. Target Canada is currently offering only a 10 per cent discount on some items during its liquidation sale. Some shoppers say that's not good enough. U.S.-based Target announced last month it was closing its 133 stores in Canada. A group of liquidation companies is overseeing the clear-out sale. The liquidators will make a commission — a small percentage — off every item they sell. "The motive for the liquidators is to sell the [merchandise] at the highest price because they get paid based on performance," said liquidator David Ordon with DSL Commercial in Toronto. He also is not involved in the Target sales. Besides wanting to reap profits for themselves, Ordon said, the liquidators also have a responsibility to make as much money as possible for Target Canada, which owes billions of dollars to hundreds of creditors, including suppliers. "How about all those creditors who are owed money and have goods in the store? If the liquidator and the company don't act responsibly, then those guys aren't going to see any money back on the cost of their goods." Ordon added that even though Target Canada customers are whining about the small discounts, they're still buying merchandise. So liquidators won't drop the prices until shoppers stop lining up at the cash register. "If people are buying at 10 and 15 per cent off, why would [you] give 20 and 25 per cent off?" They offer [goods] up at 10, 20, 15 per cent off and they sell as much as they can. And as sales diminish, they increase the discounts," he said. Some shoppers CBC News spoke with were clutching Target purchases even as they launched their complaints. "I expected deeper discounts," said Scott Barry, who still stocked up on pop at 10 per cent off. Christina Strait said the discounts were "disappointing." But she still bought Valentine's Day supplies discounted by only 10 per cent. So when will shoppers lose interest and liquidators feel the need to slash prices? According to court documents, Target Canada has to vacate its stores by May 15. Vancouver liquidator Schwarz predicts Target Canada will start offering big sales in a couple months. "Come mid-April, I think that's when they're really going to be dumping product." Ordon believes the big discounts won't happen overnight: "You'll never one day wake up and they've gone to 50 per cent off. They will do a slow progression over a period time." He suggests prices will drop by 10 per cent increments to the point where, in the last couple of weeks, goods may be discounted by 60 to 80 per cent. So shoppers looking for big price cuts will just have to wait. However, Schwarz said, while the discounts at the end may be great, the selection may not: "Sure it'll be 60 per cent off if you want a size 54 jeans with a size 42 shoe."